Jet Set Smart: HAPPY VALENTINE'S DAY JET SETTERS! 1- Buy a great bottle (or two) of Rioja wine. 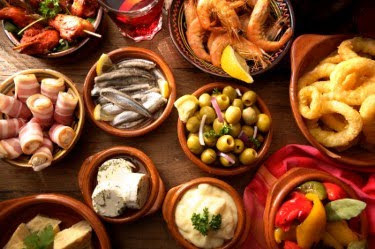 2- Make some Spanish Tapas for dinner. You don't have to be a "Julia Child" in the kitchen...some are really easy to prepare and make! I promise! 3- Rent the movie Vicky Cristina Barcelona. It takes place in Barcelona, so you can't get better than that! Sure, you make look around your living room and know that you are really NOT in Spain, but at least for the night you can do something romantic and fun. Plus, if you both really enjoy it, you can think about jet setting to Spain in the future, and letting Jet Set Smart help you plan your trip! Happy Valentine's Day! Love that movie! Had no plans tonight, thanks for this great idea!